Is there another pair of drivers who dislike each other so obviously? Drivers get angry in the heat of the moment, but these two seem to hold a genuine grudge. Silverstone 2014: constant whining and bickering about who is exceeding track limits, Vettel complains about how Alonso is running him off the circuit. I don’t ever remember more complaining in any race between two drivers. Brazil 2016: Vettel overtakes Alonso and shoves him off the circuit. Alonso responds with an angry team radio. Malaysia 2017: Vettel is chasing Ricciardo, then Alonso holds up Vettel massively when being lapped. Vettel says on the team radio “come on Fernando, you’re better than that”. China 2018: Alonso overtakes Vettel and runs him off the circuit completely, Vettel responds with an angry radio message. Not a fan of fireworks or bad blood between drivers but I really wish Fernando was more in a place to cause Sebastian to have to deal with him. OTOH I am glad that Sebastian and Lewis seem to genuinely enjoy racing each other. The Baku 2017 incident is the only time any serious off track acrimony was evidenced between the two champions that I can remember. Would be great if all the Merc, Ferrari, and RBR drivers had to come to terms with Fernando. I don’t see anything to suggest that they don’t get along with Fernando. Alonso seems to have a problem with specifically Vettel and only Vettel. Lewis cried about the same kind of move put on him by Max. I'm no fan of these moves, but Lewis and Seb crying about them is pretty rich considering it's an accepted move that happens multiple times in every GP and they themselves have pulled it on people more times than I could count. Magnusson and Hulkenberg are also not best buds. Did you see them on lap 1 in Bahrain. Both had pushed the other off the track by turn 4. 1. Vettel is the reason why Alonso is not a 4 time world champion. 2. Vettel’s move to Ferrari has been a bigger success than Alonso’s move to McLaren. If Vettel wins a WDC with Ferrari, Alonso might just lose the plot. Add to this that I think Alonso believes Vettel is an unworthy 4-time champion. He's made a number of comments to that effect, from saying he was racing against Newey back when Vettel was winning titles to more recently saying it was odd for Vettel to have more titles than Lewis. He's bothered much more by the fact that Vettel has more titles than that Lewis does. Why would Alonso hate Vettel? I can’t remember a specific incident or moment where they had a big issue in the past. Maybe Alonso just holds a grudge from being soundly beaten during the Vettel/Red Bull sweep? I'm not so sure. Vettel isn't the reason Alonso isn't a four-time WDC - Alonso is the reason. If he hadn't burnt his bridges with McLaren after one season, wasted two years with Renault, and joined the only (at the time) remaining top-team with a free seat just as the Red Bull period of dominance was beginning he might have more than two titles to his name. That being said, Alonso in my opinion deserved the 2012 title so I could imagine him being a bit jilted at having lost out to Vettel on that one. I'm not so sure his lack of success at McLaren is a reason for him to dislike Vettel specifically, though I can understand the frustration at leaving a struggling Ferrari just as they take a step up. In my view Alonso is and always has been a driver who likes to be the dominant figure on a racetrack. I think he likes to push the limits especially when he's up against a driver he knows is world class as well, because he knows there's respect and they would give it back to him given the opportunity. I wouldn't be surprised if the frustration of the last couple of years at McLaren have turned him to taking a slightly more elbows-out approach to close racing, but I think any top driver would get the same treatment if they came up against him. Alonso may also feel that he dragged that Ferrari to places it wasn't supposed to be at times during his stint, only for Vettel to come in and get a really good car by all standards. I seriously don't want to think that a mature driver like Alonso thinks like that, or at least lets it out like that, it feels very petty. He has Mediterranean temperament, which is fiery I know, but he has shown to be bigger than this, what with his reconciliation with Hamilton and McLaren. He is not a kid, maybe this move was a genuine misjudgement after all? Alonso lost two championships to Vettel in the last round of a season. 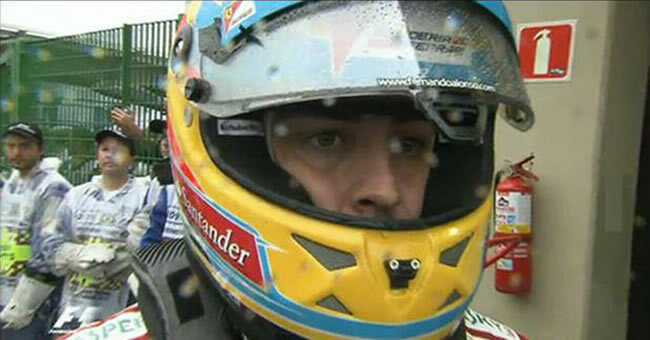 But I'm pretty sure something snapped within Alonso in Brazil '12. He was very close to that elusive third title, and there it went away from him (and maybe after T4 Alonso expected the title to be up for grabbing). His thousand-yard stare after the race (which he held for seconds) was telling. I would have thought that Spygate was at least as important in keeping Alonso out of title number 3 as anything that came later. He is far from my favourite driver, but you can't honestly point to Alonso and say he didn't drive his heart out while with Ferrari. And that is coming from someone who holds Räikkönen in far higher regard than Alonso - including while being treated as a number 2 driver by them. No one has come out and said it in this thread yet so I'll say it. I think Alonso (and some other drivers) thinks that Seb is a very good but not a great talent. Alonso sees Seb as a guy who has great timing and has been in the right places at the right times in his career. He feels that Vettel has posted bigger career stats than him despite being a lesser driver than him and that Vettel's name will loom larger in the record books than his own in the future despite the "fact" that he's not as good of a driver. Yeah, racing drivers tend to be pretty self-obsessed people. Vettel is a bit of an outlier in that regard. I always got the impression that he was really more of a normal guy in terms of his mentality. Maybe Alonso just thinks Vettel's a d!ck? Sometimes people clash and just dont get on. Oh come on. There are schoolboy grudges up and down the paddock, in the car and out. F1 was built on fairy cakes like this. I think Alonso's head might well explode. Ever work with someone who gets promoted over you despite, in your own eyes, being inferior at the job? Certainly winds me up a treat. Similar thing at play here I imagine, hard to knock him for it, it's a very human trait. I said that already. I do think it's true. I think it's a bit of everything mentioned above tbh. It's been going on since at least the mid point of 2010 any time they are near each other on track you can see they both want to make a statement. I do think if Alonso had won 2012 it would've calmed it down, they'd have come out of it 1 a piece and both been 3x winners so what followed with Alonso leaving Ferrari wouldn't have stung as much and I think Alonso would be a bit fairer in his assessment of Seb's skills. As it was it just made it worse in Alonso's eyes clearly. It's a bit easier for Seb to be more pragmatic when's he's the one that got '10 +'12 and who got a competitive Ferrari and was lapping Alonso every race for 3 or 4 seasons. Seems like they get on fine in the press conferences. I wonder would this go some way to explaining Nando's attitude to & apparent dislike of Seb especially under blue flag conditions. It might also shine some light on Seb's 2014 season. Considering how dissapointing Alonso’s career has been after his first renault stint I suspect he has a list of grudges a lot longer than just Vettel. That’s total nonsenses. To think Vettel isn’t on the same level as Alonso is preposterous and speaks of either favoritism for him or a genuine dislike for Vettel. The two drivers we KNOW who compare rather equally are Alonso & Hamilton and right now Hamilton is in a Mercedes while Vettel is in a Ferrari and the last 2 seasons when the Ferrari bridges the gap, Vettel has once again taken the fight to the front, fair and square. Vettel is every bit as good as Alonso but Alonso’s been less than patient (aside from his first move from Renault to McLaren) and it’s cost him in terms of underperforming cars and teams. His stint in Ferrari also hindered his ability to land elsewhere after the general consensus became that his attitude and demanding nature deem him too much to take on for any contending team to hire. I think Alonso and Vettel on Ferrari would be almost identical to a Alonso and Hamilton in 2007 and I’d venture to say Vettel would edge Alonso because he’s shown he’s willing to do whatever it takes to win, even if it means attacking his teammate and exercising what’s in his personal best interests over his team so long as it didn’t hurt the team too much. In that sense I think Alonso isn’t as much of a loose cannon, so I’d give Vettel the edge. Alonso is likely a hair better than Vettel come Sunday’s, but Vettel is vastly superior on Saturdays and he’d enjoy starting well ahead of Alonso pretty much every weekend, and Vettel is by far not easy to pass, so therefore, IMPO Vettel would best Alonso. First off, and just to clarify, 'I do think it's true' was actually meant to say that I do think Alonso believes Vettel is inferior to him. 1) Alonso has never been soundly defeated by a teammate like Vettel was by Ricciardo. Say what excuse you want about his motivation, that was a pure 100% beating. 2) Vettel is now headed for a second season where he can barely out-qualify Raikkonen. Alonso only had one year, but it wasn't anywhere near close. 3) Vettel has a well-documented (if infrequent) problem with losing his head during races, resulting in a 'red mist' effect. This has cost him race wins. 4) Vettel's spacial awareness at the start is questionable, with far more first corner incidents than the other top drivers. You also decided to perpetuate that complete urban legend that Alonso is a mediocre qualifier, which I find particularly annoying. It is built entirely on his years at Ferrari when the car was very rarely capable of pole, and it is in no way backed up by statistics. Alonso's overall qualifying record against his teammates is every bit as good as Vettel's, he matched Hamilton in qualifying when they were teammates, and he never had any problems qualifying against Raikkonen - something Vettel seems to struggle with every other season. There is absolutely no basis to say Alonso is anything but a top qualifier. Frankly, to say that Vettel would enjoy starting 'well ahead' of Alonso if they were teammates is the only total nonsense being bandied about here. When Vettel puts in a season as good as Alonso's 2012 or 2006 efforts then we will talk. As of now I consider Alonso to still be the best all round driver in F1, and I don't even think it's all that close. I agree about Alonso being the best, mikey, however, in doing so, I probably invalidated your post in the eyes of my "fans". You're entitled to your opinion but when paired together, nothing Alonso showed me convinced me he was superior to a rookie Lewis. Nothing. As for the not even close bit, hyperbole, surely? It can also be when Alonso puts in a season as good as Vettel's 2011 or 2013. Even with the Mercedes dominance none of their drivers to date has put in a season as good as that. It's not nice to see how little credit that Vettel gets from the likes of Alonso, you threw away the Ferrari seat Alonso. A very small data set. Alonso has been in F1 for 16 seasons. The two years he mentioned obviously. What you're looking for is dominant car years, ie poles to flag, multiple wins in a row type of year etc... Well guess what you need for those kind of years. A completely dominant car, bulletproof reliability and a team mate in your pocket. His pockets tend to be full and he's had both good and bad cars reliability wise but alas no dominant cars as of yet, not even the quickest one over a season, and very unlikely to have one so there's zero chance of those kind of years but next to Webber in a Red Bull and he'd have a good chance imo. Next to Nico in a Merc, probably not as the situation was different because of how dominant it was it allowed Nico to always be the one right behind and they weren't allowed to split strategy so often it just came down to qualy where Nico was at his strongest or the start which is arguably the only meh weapon in Lewis's arsenal, so it was pretty unique circumstances all in all. 2017 for Seb and what's looking like 2018 for Lewis anyway (But could switch as it's still very early) are examples of 2006 and 2012 type years where you could be in the running if you're consistent enough. You can add the Bull drivers too for this year in a 2012 context (regular half a second deficit to pole sitting Vettel but less deficit in the race). We'll see how they get on but so far only Dan seems consistent enough but it's way too early to call. The years I mentioned previously? Vettel 2011 was exceptional certainly his best year. His 2013 as an overall package I wouldn't say was his best work. He definitely managed to lock out what his car was a capable of in the second half of the season but I found the first half a bit lack lustre if we are judging it as right at the top end of brilliance. Vettel is a great F1 driver. For me he stands on the precipice of the top 10 of all time so I'm honestly not trying to do him down. I just don't think over his career he has been as impressive as Alonso. Over his career he has been head and shoulders above Alonso, except if viewed through rose tinted glasses. Since '07 F1 has revolved around 2 drivers Vettel and Hamilton they were up n coming then, but now have 4 titles each when this era of F1 is written in future, Alonso is just going to be a footnote in it harsh but true.